Videos, examples, and solutions to help Grade 5 students learn how to subtract fractions making like units numerically. 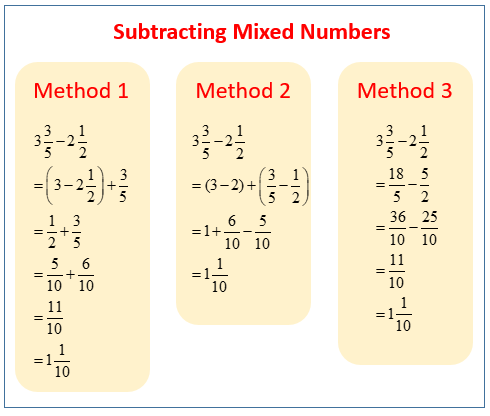 The following examples show the different method that can be used to subtract mixed numbers. Scroll down the page for more examples and solutions. Meredith went to the movies. She spent 2/5 of her money on a ticket and 3/7 of her money on popcorn. How much of her money did she spend? 1. Generate equivalent fractions to get the same unit, then subtract. This video demonstrates how to subtract fractions by finding like units. Number lines and equivalent fractions are also stressed and utilized to solve equations using multiple methods. 1. First find a common unit, then subtract. 3. 4 1/2 yards of cloth are needed to make a woman’s dress. 2 2/7 yards of cloth are needed to make a girl’s dress. How much more cloth is needed to make a woman’s dress than a girl’s dress? This video shows 3 techniques for subtracting with mixed number minuends and subtrahends. 4. Bill reads 1/5 of a book on Monday. He reads 2/3 of the book on Tuesday. If he finishes reading the book on Wednesday, what fraction of the book did he read on Wednesday?